This is a fully independent review. I have tested the Doit browser version (3.7.22) and desktop app (1.6.6) for a month using Safari (it also runs on Firefox and Chrome) on a 2009 iMac and a 2012 MacBook Pro (both running Mountain Lion), as well as the IOS versions (3.9.4) for iPad and iPhone. 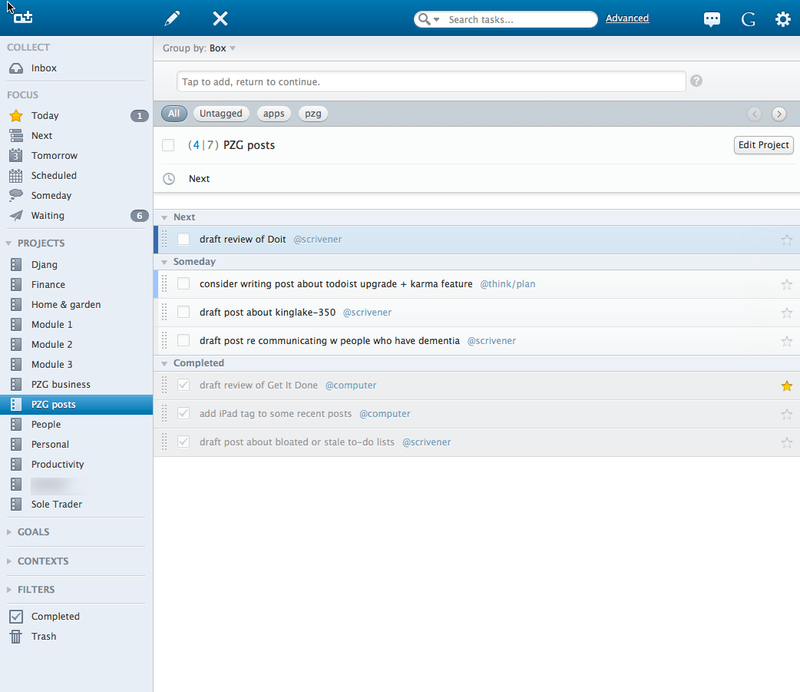 The first screenshot below shows Doit‘s project view. My project is called ‘PZG posts’ and the tasks are sorted by status (today, tomorrow, next, scheduled, someday, waiting, completed, archived). 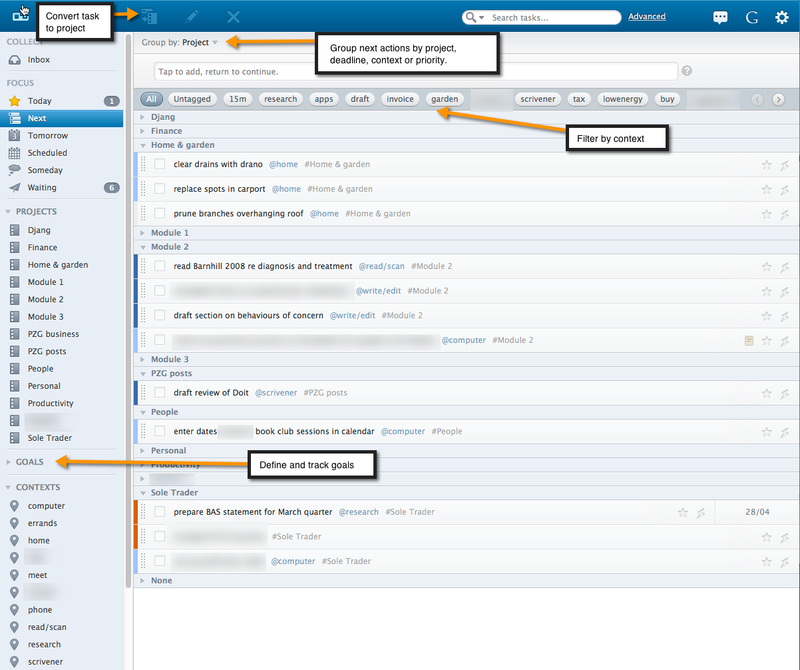 You can also sort tasks by context, start time, deadline or priority, or filter them using user–defined tags. I find the project view informative. You can add a descriptive paragraph underneath the project title; and a counter in front of the project name keeps track of active tasks and the total number of tasks in the project. You can add tasks by clicking on the button in the top left of the screen, by typing in the task entry bar or by pressing a keyboard shortcut (N). As Doit does not support inline editing, learning the keyboard shortcuts will save you a lot of unnecessary clicking. You can assign your task a project and a context—and delegate it to a contact if you wish. 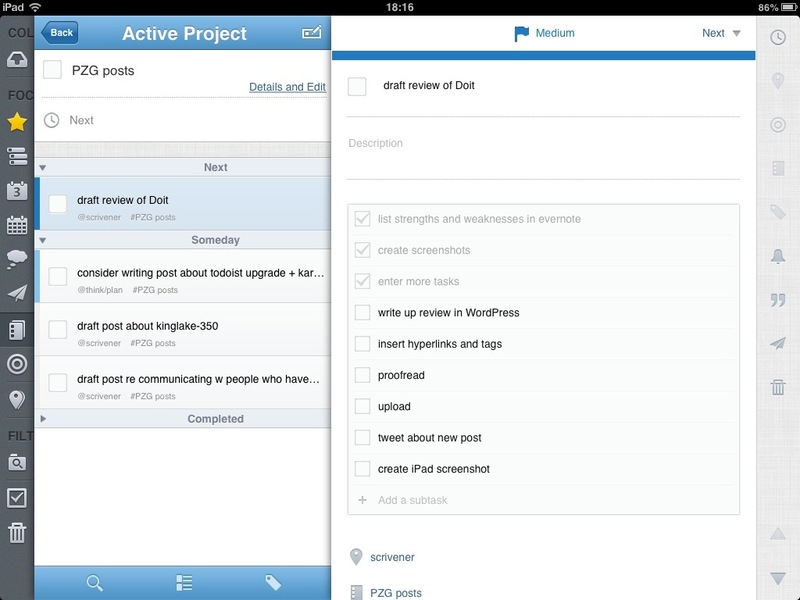 You can also give your task a start and due date, a priority, multiple tags; and add notes or reminders. Recurrent tasks can be scheduled using a number of basic cycles (but not from a completion date). Assigning a star to a task marks it for completion today; and clicking on the ‘doit now’ lightning bolt icon flags the task(s) you want to complete next. A great way of prioritising within your list of daily priorities. 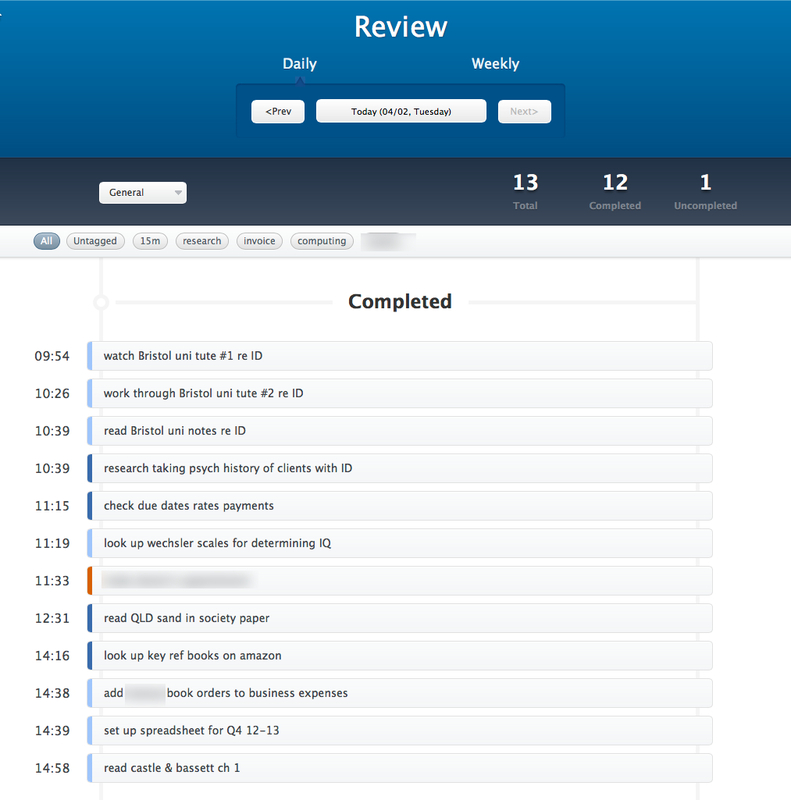 If you are willing to pay for the premium version, you will also be able to create subtasks. A minor annoyance is that subtasks cannot be re–ordered using drag and drop, so if you belatedly think of another subtask it will forever be at the bottom of the list. Doit feels very similar to Nirvana, with standard views, projects, contexts, filters and goals shown in the navigation pane on the left. The ‘tag cloud’ above the task list lets you filter your tasks by context or by user–defined tags. For example, you can create a ’15m’ tag to mark tasks that you can complete in fifteen minutes or less, or a ‘bills’ tag to keep track of invoices. Tasks can have multiple tags. As you will see from the screenshot, Doit also lets you track goals. This is a feature of the premium version and I am a bit underwhelmed about its execution. Goals, in Doit, are essentially projects that are set up in a separate section of the navigation pane. While tasks associated with goals also show up in the standard views, I find Doit’s way of separating goals and projects unhelpful, as it effectively forces you to review your projects in two separate places, which goes against good GTD® practice. Doit’s approach does not reflect that goals sit higher in the productivity hierachy than projects. It also assumes that ‘regular’ projects are not related to one’s goals, which is hardly ever the case. I would much prefer the capacity, as in ToodleDo, to assign a goal to a task at the point of entry and to review progress towards goal attainment across all projects. Another interesting feature of the premium version is Doit’s review mechanism, which was still in beta at the time of writing. 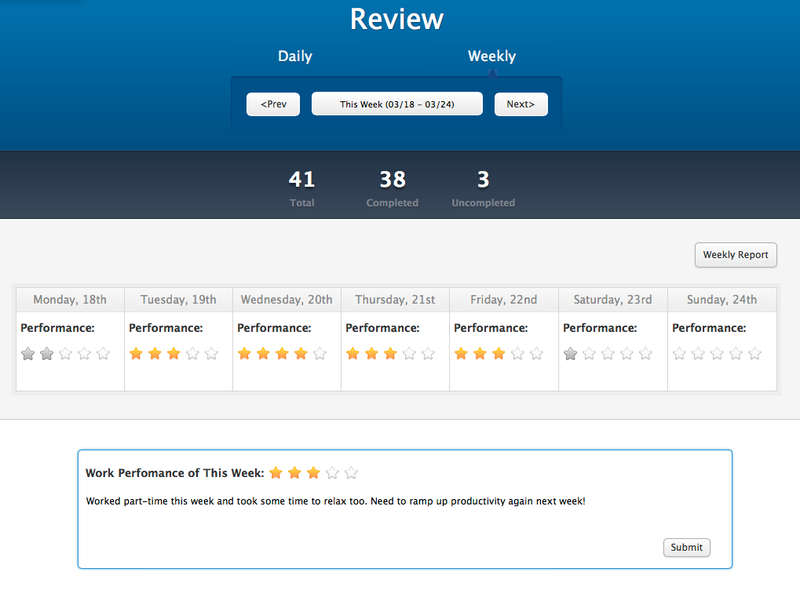 In David Allen’s Getting Things Done® approach, the weekly review process is foward–looking. You review your active tasks with a planning focus: what do I need to do next to keep each project moving? In Doit, the focus of the built–in review mechanism is retrospective, looking at your performance for the past day or week. I do not think that is a problem, since nothing stops you from doing a traditional GTD® weekly review alongside Doit’s offering. easy to use, reliable and affordable. no capacity to schedule repeating tasks from last completion date. Doit is a fantastic browser–based productivity app. It is GTD®–compatible, easy to use and comes with informative default views. While the free version is a capable task manager in its own right, it only lets you sync once per day. For a low annual fee ($20) the premium version adds compelling features: subtasks, filters, goal tracking, unlimited syncing and a mechanism to log and review your tasks on a daily and weekly basis. Doit’s browser version is complemented by a desktop app and by attractive mobile apps. Syncing is immediate and reliable. If you need to reorder or indent subtasks, you may want to check out Omnifocus. If you need to attach a variety of files you may want to check out Pagico. If you require integration with Evernote you may want to consider Zendone, Nozbe, IQTELL or Get it Done. All of these apps are reviewed elsewhere on this blog—just click in the tag cloud to the right to bring up the relevant posts. Have you used Doit recently? What do you see as its strengths and limitations? We’d love to hear from you! This entry was posted in productivity and tagged doit, email integration, goal tracking, GTD, iPad, productivity, to do app, toodledo by Gilbert Van Hoeydonck. Bookmark the permalink. Just a note – you can now order subtasks in the iphone app.